The latest Fender Custom Shop creation will be a limited edition Stevie Ray Vaughan "Lenny" guitar. Only 185 of these guitars will be made available in the US, all through the Guitar Center chain, at a price of $17,000 each. This guitar will be an exact replica of the original "Lenny", right down to every nick and scratch. Saw this on Boing Boing. This guy made a great looking guitar out of a $15 IKEA end-table. He says one table can yield enough wood for 3 guitars. Selling price is $1500. EIG Events Group has announced the launch of a new international event called GuitarXPO which will take place at the Long Beach Convention Center in Long Beach, California on July 7-­8, 2007. GuitarXPO will be the largest manufacturer-­driven event open to all guitarists, professional and enthusiast alike. 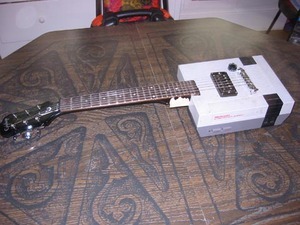 This guy took an old Nintendo and made a guitar out of it. Too cool! "Partnering up with musical instrument craftsman, Luis Alberto Paredes, Cesar Lopez has been creating the instruments ever since. Initially made out of Winchester rifles, they are now made mostly from everyone's favorite Cold War assault rifle, the AK47." Saw this on Engadget. 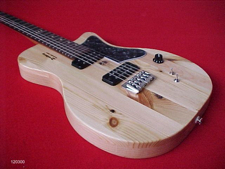 Gizmag.com has posted an article on the Transperformance self-tuning guitar. Looks pretty wild. Brian Moore has taken their iGuitar line of digitally-equipped guitars, and added class-compliant USB, via the new iGuitar.USB model. Plug it into a USB jack, and you have instant access to your sound in recording and effects software, no drivers required. Saw this on SteveMorse.com. The Ernie Ball website has a cool feature on the new MusicMan Steve Morse SM-Y2D model guitar, including 3 video clips.